We survived train trip #2, go us! It’s easier to travel by train instead of a car when we visit my mom. A few months ago I attempted a long car drive with Little T. He cried the whole way and it was traumatic for both of us. 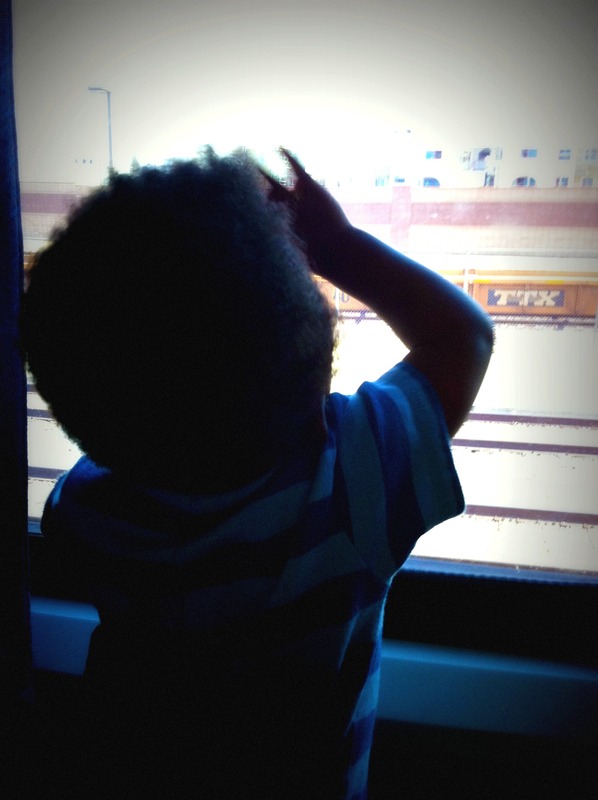 When we take the train, I can entertain Little T along the way. We also don’t have to make extra stops, and Little T likes getting 100% of my attention for 5 hours straight. It’s better for the environment too, so it’s a win/win. To make the trip a little easier, I use an overnight diaper for Little T. It’s leak proof, and I can get away with changing his diaper once, halfway through the trip when we stop for a change over. I also usually prepare food in advance for the train trip, but this time it was a last minute trip and I didn’t have enough time to get anything together. I had to use what we had on hand, so I packed a few black bean burgers, a banana, and some other snacks for Little T.
For myself, I packed a Kind Bar and some Chili Lime Kale Chips. Those kale chips had an intense amount of flavor and I loved them for it. I’ll have to forget food again so I’ll have another excuse to eat them, heh heh. I always try to pick a time that goes with Little T’s nap schedule. It’s easier if he sleeps for the first couple of hours while we’re on the bus. Once we make it onto the train, the trip is a breeze. I have a few toys that Little T likes, but he enjoys looking out the window and doesn’t need a lot to stay happy. I love that we can get up and walk to the dining car if Little T starts to feel squirmy on the train. If we stopped in the car and took a break from the seat, we’d be adding a lot of travel time to the trip. Big T and I used to take the train and play cards for the whole trip. It will be fun when Little T’s old enough to do that with us.